David Grubb returned to West Virginia after working for consumer advocate Ralph Nader. David toured the state talking to potential supporters about forming a statewide organization designed to represent the interests of average citizens. In less than three weeks, David raised the “start-up” money for this idea. WV CAG released an in-depth study that documented over 400 synthetic chemicals suspected of being routinely discharged into the Kanawha River. This report was later cited as an important contributor to the passage of the federal Safe Drinking Water Act of 1974. 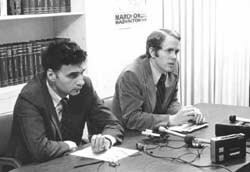 Passage of a state freedom of information act, the enactment of prescription drug price posting/generic drug substitution legislation, the abolition of the automatic fuel adjustment clause and the repeal of the state consumer sales tax on food highlighted WV CAG’s participation in its first legislative session in 1975. Staff: David Grubb, Perry Bryant, Anne Romance, Scott Walker, Clark Sheldon-Whiteside, Marvin Wanetick, Barbara Dungey, Chuck Hampsher, Jim Worthington, Dave Parry, Kent Moreno, Chris Bathurst, Kathy Hamsher, Jeanne Vencill, Dave Wibberg, Lizz Frost, Will Carter, Sylvia Ward, James Spencer, Mary “Ginger” Kessell, Jeff McCroskey, Kathy Josephson, & Cheryl Sheldon-Whiteside. 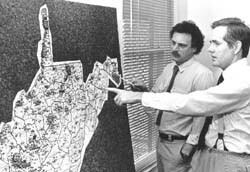 WV CAG’s utility reform work led to the passage of the Utility Reform Act, giving the Public Service Commission the authority to regulate the practices, services, and rates of public utilities; and the establishment of Consumer Advocate Division, which advocates on behalf of consumers in utility rate cases before the Commission. WV CAG successfully argued an important First Amendment case before the state Supreme Court, establishing the right of our canvass program to communicate with citizens at their doors about key issues of public importance. 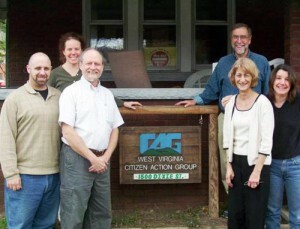 The West Virginia Environmental Council was formed and staffed by WV CAG. Major environmental bills were passed on issues including groundwater, recycling, solid waste, incineration, nuclear waste, and hazardous waste. WV CAG, working with the People’s Election Reform Coalition, published an in-depth analysis of the role of special interests in the 1996 and 1998 elections for the first time in West Virginia history. WV CAG’s research arm, released “Dioxin Contamination of the Ohio and Kanawha Rivers.” This report was a comprehensive and historical recount of industry’s legacy of pollution and its effect on our waterways and citizens. The effort led to the Environmental Protection Agency declaring parts of the Nitro area a Superfund site. 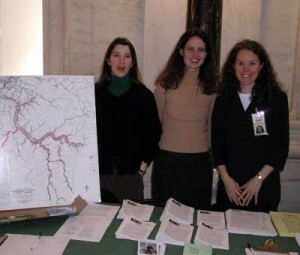 In February 2005, WV CAG coordinated the efforts of a successful statewide coalition aimed at protecting America’s most successful anti-poverty program, Social Security, from privatization, which would have cut guaranteed benefits, increased the federal deficit, and possibly raised the retirement age. After the 2004 election, WV CAG supported the formation of and worked with West Virginia Citizens for HAVA (Help America Vote Act), a grassroots group promoting accurate and secure voting technology for West Virginia elections. With the help of Verified Voting, our groups successfully lobbied for the passage of legislation requiring a voter-verifiable paper ballot for all voting systems used in the state. WV CAG worked in conjunction with other organizations to educate legislators and the public on the need to regulate tax-exempt political organizations involved in state level campaigns. These efforts resulted in the nation’s first state law limiting contributions to 527 and other independent groups and requiring the groups to disclose the identity of their controlling entities and donors. WV CAG went back to its roots in utility reform and consumer protection, intervening at Public Service Commission opposing American Electric Power’s 43% rate hike and forming Energy Efficient West Virginia (EEWV).